For as long as I can remember my writing has been terrible. When I was in Grade 3, my well-meaning teacher made me stay in at lunch to write the letter “R.” I wrote it over and over for what felt like a million times over the entire lunch hour. This made me a very angry 7-year-old. For others this would not have been a big deal, but for me, writing has always been my biggest challenge. I have been punished for it a lot. What I didn’t know then was that on top of having #ADHD I have something called Dysgraphia. An actual medical problem with my writing. No wonder my handwriting looked so terrible! We need to get the word out that lots of kids with ADHD have Dysgraphia, too. We need to do this because kids with Dysgraphia are being punished for having a writing disability. This happened to me as early as kindergarten. 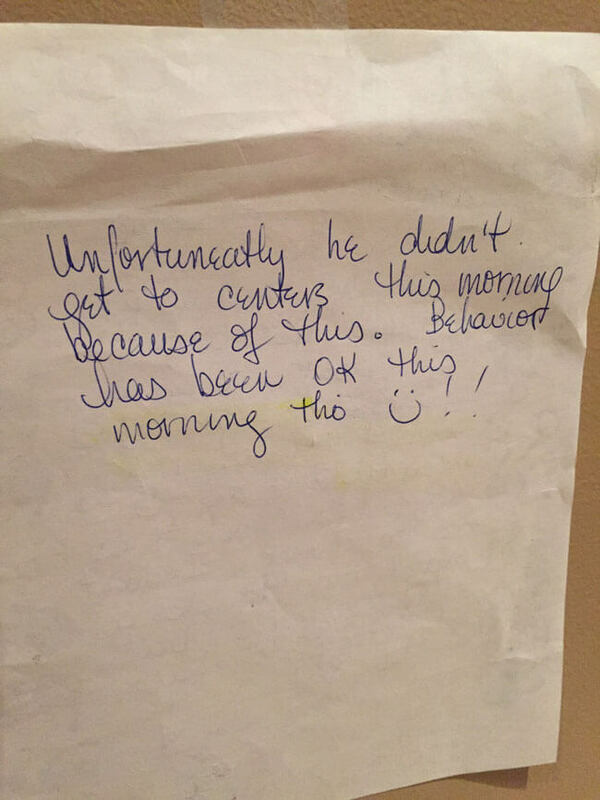 Check out the letter in this post where my teacher writes to my mom that “AS you can see book #1 was NOT acceptable – so I gave him book #2 tore-colour.” Hmmm… I couldn’t do it the first time so I had to do it again. That was the first punishment of many. Is writing a struggle? Lots of kids with #ADHD have Dysgraphia too. Dysgraphia is a learning disability that affects writing abilities, at least that is what “OK Google” says. 🙂 I pretty much believe Google and that sums it up for me. If I could write better I would. For most kids if they could do something better chances are they would. Having bad writing made me look stupid. That is a misconception teachers have that I would like to change. Bad handwriting does not equal stupid. I’m perfectly capable of thinking. I most often know the answer to teacher’s questions. But when it comes to writing what I want to say in an essay or test, it’s just incredibly difficult to get my hand to do what my brain wants it to do fast enough. If I could slow down the brain, speed up the hand…. Nothing got done… that used to be me. Exposed! 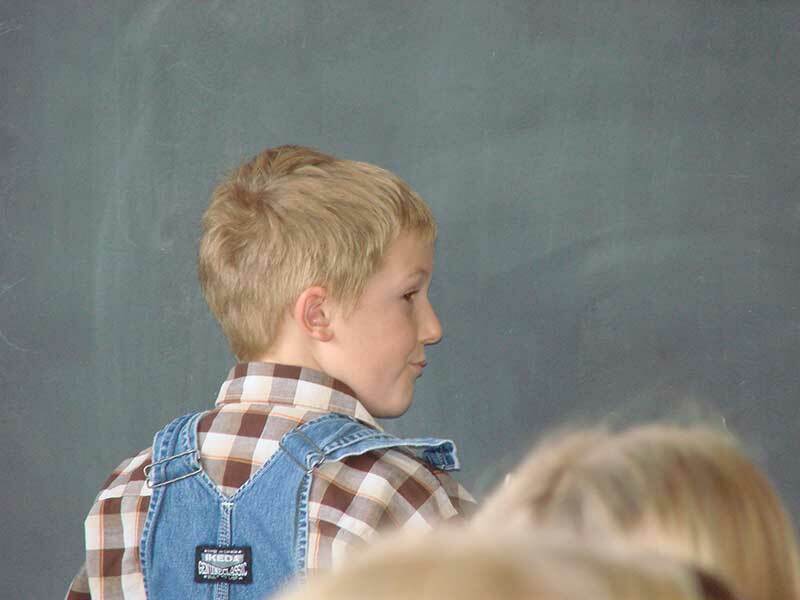 That’s me having to write on the chalkboard in front of my entire grade 3 class. It’s hard for them to even hold a pencil and when they do it’s with an awkward grip. No one can read their handwriting, even printing for some. They avoid writing, drawing or using crayons, pencils or paint brushes. They get super tired super quickly while writing. Sometimes they might talk out loud while writing. You see missing words and unfinished sentences in their writing. It is difficult for them to organize their ideas on paper. They can’t write what they are thinking. Grammar is out the window, even if they know the rules they avoid basic things like capitals and periods. There is a HUGE difference between what they know and what they can write down about what they know. What to do about Dysgraphia? If you have ADHD and are having a hard time writing and/or your teachers are always giving you a bad time about your writing, consider going to see an Occupational Therapist. My OT was very cool and she made it clear to my parents and teachers that it was not my fault I couldn’t produce written work the way they wanted it. Ok — so you’re probably wondering, if I have dysgraphia how was I able to do so many courses last year and post blogs every week? My secret weapon is “scribes.” I have people who can write for me (scribe for me) at school when I write an important test, I have the help with writing my blogs and even for help doing my homework. I talk, the scribe writes. I still have to learn to go over my work and edit. I still have to fix grammar mistakes, form sentences, and write in a way that makes sense. The scribe’s job is just to transfer what I say into writing. Imagine if no one stopped long enough to help me tell my story? Without the help of someone to write with me, I wouldn’t have been able to get this website together or keep up with the blog posts I want to write for you. What strategies do you use to get your written work done? A lot of people have asked me about Dysgraphia on my Facebook page, and a lot of people would be interested in hearing your ideas.